The Alaska Democratic Party has been giving undeclared assistance to “nonpartisan” and other candidates. Along with Ship Creek Group, a campaign management company based in Anchorage, the Democratic Party has been allowing them to gain a $2,000 advantage over their competitors in races by giving them access to valuable lists, according to a complaint filed with the Alaska Public Offices Commission on Thursday. Call it list laundering. While some candidates, like Rep. Ivy Spohnholz, paid full value for the data, others, like non-declared Jason Grenn, got the service for pennies on the dollar by going through Ship Creek Group. It’s illegal, alleges Forrest McDonald, who at times has been a candidate but now mainly runs local and state campaigns. He told the Alaska Public Offices Commission this week that Ship Creek Group has been giving candidates access to a database owned by the National Democratic Party, and that is valued at $2,000 for every client they give it to. Neither candidates nor the party are disclosing the in-kind contributions to the watchdog agency. Ship Creek Group is paying the $2,000 for access to the database called Votebuilder, and then giving their clients access to voter files as a part of a service bundle. Votebuilder is exclusive to Democratic organizations and is used by subdivisions of the Democratic Party across the nation, including Barack Obama’s presidential campaign all the way down to local races. The Alaska Democratic Party has what’s called a “Coordinated Campaign,” where it offers services to Democrats, and now some chosen nonpartisans. Ship Creek Group burst on the scene a few years ago, and quickly formed an alliance with the Democratic Party and Union political machine Lottsfeldt Strategies. John-Henry Heckendorn, Ship Creek’s founder, could be found at Jim Lottsfeldt’s house most nights, along with Midnight Sun AK blog’s Casey Reynolds. Midnight Sun is a subsidiary of Lottsfeldt Strategies, which has also listed members of Ship Creek Group in its stable of talent. Today, Heckendorn is embedded as a de facto state-paid campaign manager for Gov. Bill Walker, and is seen with him everywhere. The Coordinated Campaign service costs $1,000 for a municipal race, $2,000 for a state house race, $4,000 for a state senate race, and $25,000 for a statewide campaign. Votebuilder access is strictly limited to Coordinated Campaign members, and limited access or individual mailing lists are not available for purchase. The Democratic Party has an undisclosed relationship to “Ship Creek Group.” No APOC transaction history between the Democratic Party and Ship Creek Group has been disclosed to pay for Votebuilder access. One transaction is disclosed in Federal Election Commission filings, but the October 2015 transaction is insufficient to explain the goods and services received. Some candidates using Ship Creek Group’s services paid the fee, while others did not, possibly to avoid disclosing coordination with the Alaskan Democratic Party so voters would not be made uncomfortable. Alaska Democratic Party Campaign disclosure statements between Feb 2015 and Sept 2017 showed that some Ship Creek clients disclosed payment for Coordinated Campaign data service while others did not. No transactions between Ship Creek Group and the Alaskan Democratic Party to pay for data services were disclosed to APOC. FEC filing entry which shows that Ship Creek Group paid only once for data access, and they only paid $2,000 although the actual fee for statewide use of Votebuilder per campaign is $25,000. Rep. DeLena Johnson says that she told Ship Creek Group specificially to only use Division of Election data, and not to use the Democrats’ data. The complainant, Forrest McDonald, runs a campaign consultancy called Fire Island Strategies. When he started looking into the relationships between Ship Creek Group, the Democratic Party, and certain candidates, he concluded that some nonpartisan clients are also using the Democrats’ database in violation of the national party rules, which excludes all but Democrats from access. Jason Grenn and John Weddleton are registered as “other.” Gary Knopp and DeLena Johnson are Republicans, and it’s unclear if the fees they paid to Ship Creek Group covered use of the Democrats’ list. McDonald also alleges that candidates like Grenn were not disclosing that they used the Democrats’ database, because they were trying to hide their affiliation with the Democratic Party. $.30 per trans. + 3% * amount. “The FEC filing entry shows that Ship Creek Group paid only once for data access, and they only paid $2,000,” McDonald said. “Some candidates, like Ivy Spohnholz, are wide-open Democrats and disclosed their relationship. But there was another category of candidates who did not disclose it,” McDonald said. 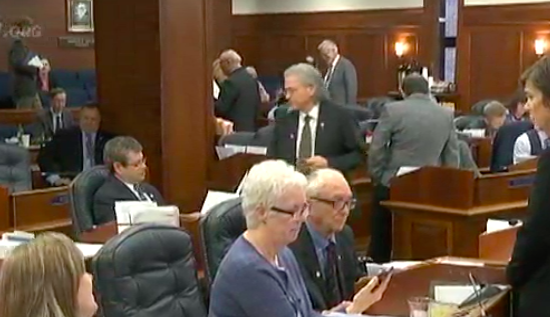 That includes Republicans Gary Knopp and DeLena Johnson, of Kenai and Palmer, respectively. APOC has yet to post the complaint on its web site. But staff will look at the allegations and make a decision about whether giving free access to valuable lists that some candidates pay dearly for is a form of unfair and undisclosed advantage. Then, the agency will need to decide whether it will subpoena documents from candidates, Ship Creek Group, and the Alaska Democratic Party, which was notified of the complaint earlier today. McDonald did not pursue whether Ship Creek Group is allowing Gov. Bill Walker to use the Democrats’ data from Votebuilder or from another source. “What comes to mind, was this being used by the governor’s paid operative, John-Henry Heckendorn and his company, to grant favors to some candidates and not others?” said Tuckerman Babcock, chairman of the Alaska Republican Party. The Democratic Party has changed its rules to allow others to run in their primary. But the national rule governing the use of Votebuilder is clear — it’s for Democrats only. If you’re using it, you’re part of the Coordinated Campaign of the Alaska Democratic Party. Quote of the Day: AG calls SB 91 an experiment? Wait, wha-a-t?